Mohawk Drumlin Creamery – From Ewe To You! Sheep’s Milk Yogurt is richer in vitamins A, Folic Acid, B12, calcium, magnesium, phosphorus, potassium, copper and manganese than cow’s milk yogurt. 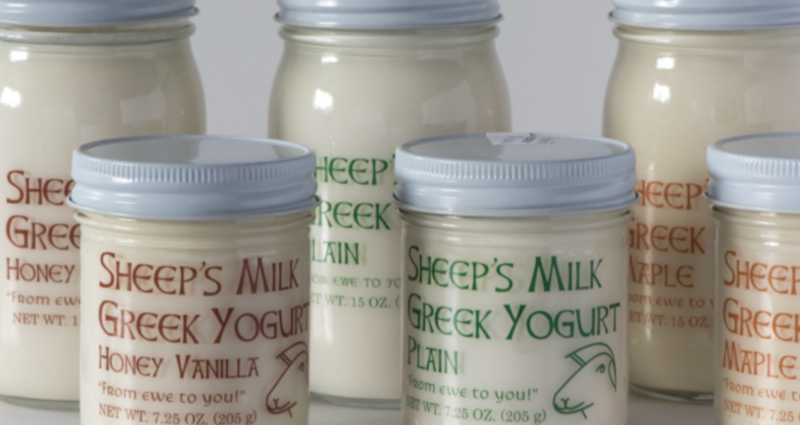 Sheep’s milk is 10% lower in lactose than cow’s milk – even less after the live yogurt cultures break it down! Sheep’s milk has a higher proportion of short- and medium-chain fatty acids, which are more easily broken down than long-chain fatty acids, and can reduce serum and plaque cholesterol levels. Sheep’s milk has smaller fat globules than in cow’s milk, so it is more easily digested. Sheep’s milk has up to twice the milk solids of goat or cow milk. So, the yogurt achieves the thick rich Greek yogurt consistency with no added gelatin, starch or milk solids, and without having to drain off any whey. Sheep’s milk has more conjugated linoleic acid (CLA) than cow or goat milk. CLA reduces body fat while preserving muscle tissue, improves insulin action while reducing circulating glucose, and tranforms to powerful anti-inflammatory agents. Sheep’s milk beta casein proteins are strictly ‘A2’. The A1 beta casein found in most cow’s milk is often the cause of digestive intolerance of dairy, and this is why many people who cannot drink cow’s milk can consume Sheep’s milk dairy products. Sheep’s Milk Greek Yogurt from Mohawk Drumlin Creamery is made entirely from hand-milked sheep fed exclusively on GMO-free pasture, hay and grain. Our dairy shepherds are Amish who shun the use of chemical fertilizers, herbicides, pesticides and growth hormones. Mohawk Drumlin Creamery packages our yogurt exclusively in glass jars, which eliminates the risk of leaching of BPA and other potentially endocrine-disrupting chemicals from plastic packaging during incubation and storage. Also, the 16oz glass jars take a standard Ball Jar lid, which means you can use them for canning your own jams, jellies, chutneys and pickles to re-use the jar. The Mohawk Drumlin Creamery is a Grade ‘A’ Sheep’s Milk product. This means we test each load of milk for antibiotic residues, the milking parlors and sanitation procedures and milk quality are inspected and tested monthly by a NY State Certified Milk Inspector, and our own facilities are inspected quarterly by the state, and milk, glass sanitation and finished product samples are tested monthly. Sheep’s Milk Greek Yogurt from Mohawk Drumlin Creamery is a healthful and delicious substitute for sour cream or crème fraiche in your favorite recipes. Sheep’s Milk Honey-Vanilla Greek Yogurt from Mohawk Drumlin Creamery is a wonderful topping in place of whipped cream for your holiday desserts. Try some today! Mohawk Drumlin Creamery Sheep’s Milk Greek Yogurt is available at most Whole Foods Markets in New York State, many West Side Markets and Westerly Natural Market in New York City, The Community Co-op in Little Falls, NY, Mohawk Harvest Co-op in Gloversville and the Honest Weight Co-op in Albany, NY.